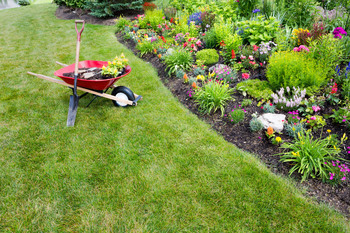 Get Your Lawn Ready for Spring! The days are getting longer, and that means it's time to jump start your spring lawn care. Scotts is a well-known, trusted brand to help you get the best out of your lawn, and Norby's Farm Fleet carries all you need! Below are some expert tips on the types of Scotts lawn care products we carry and what they do for your lawn. We carry just the right type of Scotts grass seed for the unpredictable Iowa weather! Scotts Turf Builder® Sun & Shade Mix grass seed is built to withstand the ups and downs of spring and summer weather. It comes with Watersmart Plus coating, which protects your grass in events of extreme rain events. It's an excellent choice whether you're planning on regrowing a whole yard or just patching up some unfortunate empty spots in your lawn. Once you've planted all your seeds, the first type of product you should use on your lawn to nourish it is the crabgrass preventer plus fertilizer. Applied in early spring while temperatures are still below 80 degrees fahrenheit, this product kills crabgrass before it can begin to germinate while feeding your lawn and helping it green up quickly. Next, about 4-6 weeks after applying the crabgrass preventer, you will want to apply the weed control plus fertilizer blend. It will stop dandelions and other broadleaf weeds from taking over your lawn while nourishing your grass and creating a healthy lawn to enjoy in the summer time! You will want to avoid applying this blend on a day in which you are expecting rain within 24 hours of application. These first two steps of Scotts's 4 step program will ensure a lush, healthy lawn for spring and extending into summer, and you will find all three product types right at your local Norby's Farm Fleet location. Stop by today for more information and to pick up your lawn care products for the spring!